Keith Richards was among the performers at the 2nd annual Love Rocks NYC benefit concert at the Beacon Theatre in New York on March 15, and video from the event is streaming online. The concert raised funds for God's Love We Deliver, a non-profit organization which cooks and home-delivers 1.6 million nutritious, individually-tailored meals each year to people in the New York City metropolitan area living with severe illness. 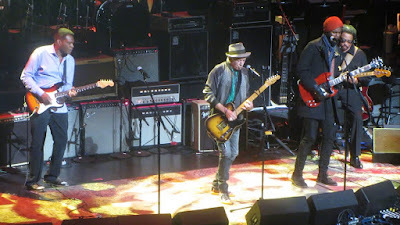 Hosted by Whoopi Goldberg, Bill Murray and the Bacon Brothers and presented by fashion designer John Varvatos and Greg Williamson, Love Rocks NYC also featured appearances by ZZ Top guitarist Billy Gibbons, Steely Dan’s Donald Fagen, Heart’s Ann Wilson, Jimmie Vaughan, Ziggy Marley and many others, backed by a house band led by Paul Shaffer. For more information on God's Love We Deliver and/or to donate, visit the organization’s website. Richards and The Rolling Stones will return to live action in May when they launch the No Filter European tour at Croke Park in Dublin, Ireland on May 17; the 14-show series will wrap up in Warsaw, Poland on July 8.